to get your entertaining space is ready for all the action. Touchdown… and the crowd goes wild! If you are planning on drawing your own crowd of fans into your living room this Sunday for the big game, make sure your guests are not just impressed with the last play on the field. Give them the game-watching experience they deserve with an updated interior motif. It all starts with the right media cabinet. This is an essential element of the perfect entertaining environment. There are lots of single-tier units for your TV and receiving equipment, but a multi-tiered model has shelves for audio speakers, books or decorative items. 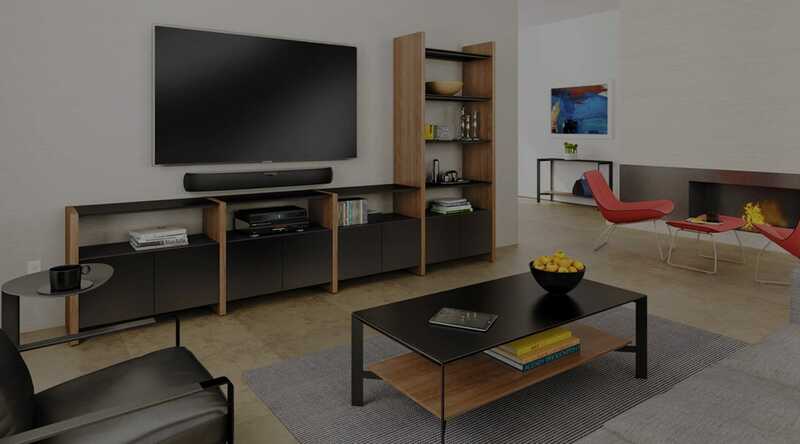 A great example is the Semblance Home Theater Package by BDI. Its shelves and drawers are customizable, so you can retain that updated vibe in your living space—keeping your sports fans on the edge of their seats in style. Do you have a Hi-Fi audio system that pairs with your TV? When it comes to properly storing this essential equipment for daily use, audio professionals use a utility tower to keep bulky electronics away from the media cabinet for an uncluttered TV viewing area. A tower manufactured with style in mind is the Corridor A/V Tower by BDI. Like their home theater, all the shelves are adjustable. Using an A/V tower is an insider tip that helps tidy the jam of wires and electronics that clutter the look of a common entertainment setup. For many, watching sports is an interactive activity. If your guests are prone to leaping from their seats to shout at the TV—whether in the throes of victory or the agony of defeat—a great furniture choice is a comfy ottoman. Because they're smaller and lighter than traditional furniture, ottomans can easily be moved for a closer view of the action. The Hecks Ottoman by Blu Dot is one of coolest available because of its hexagonal design. Its geometrical layout lets you put several of these units together to make custom arrangements. Another great ottoman is brought to us by a premier maker of comfortable and fun lounge furniture, Fatboy. The Fatboy Point Ottoman is the perfect solution when inviting a larger group over to watch the game because it comes in a wide range of cool colors, and can be quickly thrown in a closet for fast and easy storage. Your sports fans need a place to set their drinks and snacks during those tense moments when all attention is toward the TV. A proper coffee table is essential for every sports fan’s entertaining area. The Spiral Side Table gets in the spirit of the sport, featuring a twisting design reminiscent of an all-star quarterback’s winning pass. More into minimal design? Check out the Adelphi Nesting Coffee Tables by Modloft. This line of tables comes in a range of colors to match your existing interior design. However, the highlight of this piece is that the tabletops are lined with fine reconstituted leather. This subtle feature adds a tasteful aesthetic to the look of the table, and will remind sports fans of the leathery texture of a game ball. Any good sporting event party has awesome snacks and drinks. A great party serves guests in style. Since we eat with our eyes, interesting food vessels can make any dish more attractive. At first glance, the Port Basket by Alessi looks like a by-product of the metallurgy industry. However, upon closer examination, you realize that this metal basket is designed so that the edges of the piece appear crumpled, while retaining a perfectly flat middle for full stability. Rustic and industrial, this dish makes the perfect centerpiece for snacks. Finally, in any interior design, it's the little details that really impress. While considering the hippest décor for your sports watching zone, think about hanging some wall art that represents your local team without being too obvious. This wonderful line of wall pieces draws from cities with major teams – including Dallas, Detroit, Washington D.C., and New York City.